Belgrade Serbia was a city neither of us had ever been to before, and we weren’t quite sure what to expect. We were curious to see what the city would look like, and what our impression of the people would be. We were wondering if the remnants from the war that were so present in Sarajevo would be similar in Belgrade. So when we finally arrived we no longer had to wonder – our first impression of Belgrade was that of a clean, beautiful modern city. And although there were exceptions, most people here dressed so fashionable that we almost felt a bit out of place. There were more shoe shops than I could count and I wasn’t the only one drooling over the impossibly high heels in the shop windows. People in Belgrade seemed to follow the small rules that other Eastern European countries ignore, like smoking in designated areas, or waiting for the red light to turn green before crossing a pedestrian crossing. The latter was unlike anything I had ever seen – everyone, and I mean everyone, waited patiently for the red light to turn green before even thinking of crossing. It didn’t matter if the road was empty, it didn’t matter if the countdown (yes, there is a number counting down the seconds to when the light changes) has two seconds left before switching to green – they would ALL wait. 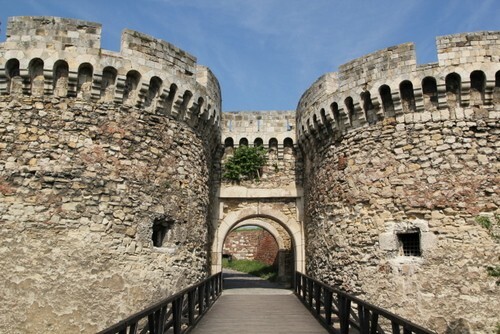 Our visit to Belgrade was fun and relaxing, but I won’t lie, we did have a few encounters where people acted very strange to us, and in Kalemegdan park we had up to five guards following/stalking us – watch our Belgrade video tomorrow to see what happened! Belgrade was a city neither of us had ever been to, and we weren’t quite sure what to expect. So when we finally arrived we no longer had to wonder. 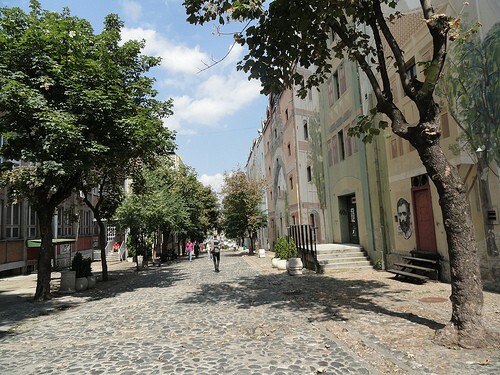 Our first impression of Belgrade was that of a clean, beautiful city. Like most countries in Balkan, we didn’t know exactly what to expect from Belgrade. Serbia has gone through quite a lot in the past decade with hyperinflation and NATO bombings etc. so we weren’t sure how it had affected the city, and how they had recovered in recent years. It turned out to be one of the most beautiful cities we had seen in the Balkans: clean and green, with fashionable girls walking down the streets in high heels that looked impossible to take even one step in. It was a city with things happening all the time – when we were there David Guetta had a show in Kalemegdan park, Moby and Amy Winehouse coming up soon, and a lot of other artists this summer. I’m not at all trying to scare people away from coming here, but I don’t want to sugar coat things either. Belgrade was bombed by NATO in 1999 and obviously some people still hold anger and resentment to it. It’s good to be aware of things like this and read up on the history of Belgrade so that you know how to deal with it in case it occurs. Most of the people we met were friendly and talkative, the same straight forward manner as in Sarajevo which after a while we found quite refreshing, I’d rather have someone being straightforward and honest than fake. If you ask a question, you will get a straight answer, they were not at all afraid to share their opinions, no matter how touchy the subject was. When you visit Belgrade, don’t miss the chance to order a coffee at a cafe in the Bohemian quarter Skadarlija. It’s the quaintest place in Belgrade to stop for a coffee break, and you will be served a huge plate of assorted Serbian sweets to go with your coffee – for free! Have you been to Belgrade? What were your impressions of the city? Yes! I can totally relate to this post. We recently stopped in Belgrade while driving our RV from Croatia to Turkey. We didn’t stay long, just an hour or so, and it blew my mind to stop in a city that I still associate with NATO bombing. We pulled off into a small commercial district tucked inside a larger residential area, and then left the camper in search of food. I had no idea what to expect, but we found a small sandwich place selling grilled paninis, and the folks behind the counter (an old man and several young girls) seemed really surprised we were there. Though we didn’t share a common language, they were all smiles and tried to ask us questions about where we came from and what on earth we were doing at their small stand. We managed to communicate that were are both American and Canadian, but that’s about it. They took special care of us and guided us gently through the ordering process (there was a crowd so it was a bit confusing), and all gave us big waves as we were leaving. They seemed so pleased that we were there, I’ll never forget it. Afterward we left the city, but needless to say, my impressions of Belgrade were 100% different after that stop. Actually we’ve spent the last four months driving with our daughter from Amsterdam to Turkey. All the countries on our route (the Netherlands, Germany, the Czech Republic, Austria, Switzerland, Italy, Croatia, Serbia, Bulgaria and Turkey) have been great in their own way. Serbia and Bulgaria were the toughest because they don’t have a lot of campsites and we had to freecamp the whole way (no electricity, laundry or internet). Turkey, where we’re spending three months waiting out the Schengen visa, is definitely one of our favorites. I love when that happens, when your presumptions of a place turn out to be completely different from what you expected. Driving from Croatia to Turkey sounds like a cool experience, which country was the most fun and/or beautiful to drive through? Thanks Slobodan for explaining why they wait for the green light, it makes more sense now, haha. That sounds even better! 😉 Turkey was also one of our favorites during our Europe Train Challenge this summer, Istanbul was fantastic! I miss that place! Was living there the last 2 months this summer until a broken arm forced me to return back to the USA sooner than expected, but yea, I loved that city. As for the crossing the street, it depends if there’s police or not. It still happens, although the majority wait, including me. I will definitely be back to Beograd. I can see why you loved Belgrade, a wonderful city. Sorry to hear about your arm, hope you’re ok now..! I’m glad you enjoyed Belgrade. The question of that old lady was stupid. “Why do you bomb as?” Oh my goodness! It was NATO, governments of certain countries, NOT American or English or some other people! So, welcome to Serbia! Hi Sophia, I am so happy that you enjoyed Belgrade:). I saw your video its excellent! :) Anyway you should be back, because there are plenty things to see that you missed (maybe). Like, St.Sava’s temple, then amazing beach called Ada Ciganlija, and austro-hungarian part of the city called Zemun. Serbia really is a lot more fun than you’d expect. I just love the pleskavitsa (hamburger). I’d advice anybody who decides to see Kosovo as well, not to accept a stamp in their passport. This would prevent them from re-entering Serbia for as long as they use that passport… Kind of stupid, but good to know. What you think, why people follows rules in the other countries? 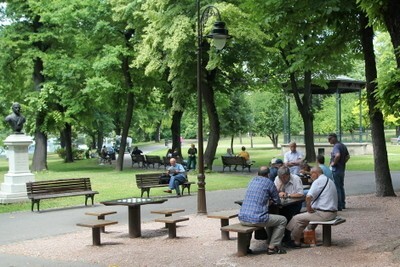 I really enjoy your article, especially since its very interesting to hear what foreigners have to say about Belgrade.